Histopathology: microscopic appearance of invasive ductal carcinoma of the breast. The slide is stained with Haematoxylin & Eosin. Histopathology: microscopic appearance of invasive ductal carcinoma of the breast. The slide is stained with an antibody (immunohistochemistry) against the ongene Her2neu. The dark-brown reaction indicates that this tumor over-expresses this gene. Cytopathology: microscopic appearance of a Pap test. The pink cell at the center with a large nucleus is abnormal, compatible with low-grade dysplasia. Autopsy: a brain surrounded by pus (the yellow-greyish coat around the brain, under the dura lifted by the forceps), the result of bacterial meningitis. 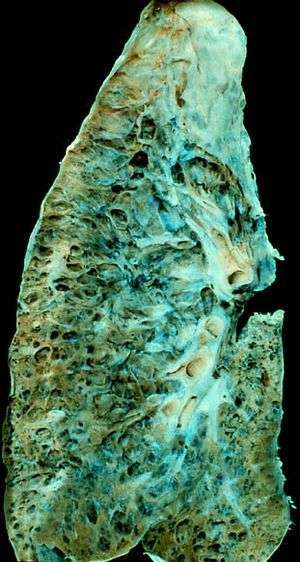 Gross examination: appearance of the cut surface of a lung showing the honeycomb pattern of end-stage pulmonary fibrosis. Gross examination: appearance of a colorectal polyp (the cauliflower-shaped tumor) attached to the colon mucosa (the horizontal line at the bottom). Anatomical pathology is itself divided in subspecialties, the main ones being surgical pathology (breast, gynecological, endocrine, gastrointestinal, GU, soft tissue, head and neck, dermatopathology), neuropathology, hematopathology cytopathology, and forensic pathology. To be licensed to practice pathology, one has to complete medical school and secure a license to practice medicine. An approved residency program and certification (in the U.S., the American Board of Pathology or the American Osteopathic Board of Pathology) is usually required to obtain employment or hospital privileges. Gross examination - the examination of diseased tissues with the naked eye. This is important especially for large tissue fragments, because the disease can often be visually identified. It is also at this step that the pathologist selects areas that will be processed for histopathology. The eye can sometimes be aided with a magnifying glass or a stereo microscope, especially when examining parasitic organisms. Histopathology - the microscopic examination of stained tissue sections using histological techniques. The standard stains are haematoxylin and eosin, but many others exist. The use of haematoxylin and eosin-stained slides to provide specific diagnoses based on morphology is considered to be the core skill of anatomic pathology. The science of staining tissues sections is called histochemistry. Immunohistochemistry - the use of antibodies to detect the presence, abundance, and localization of specific proteins. This technique is critical to distinguishing between disorders with similar morphology, as well as characterizing the molecular properties of certain cancers. In situ hybridization - Specific DNA and RNA molecules can be identified on sections using this technique. When the probe is labeled with fluorescent dye, the technique is called FISH. Cytopathology - the examination of loose cells spread and stained on glass slides using cytology techniques. Electron microscopy - the examination of tissue with an electron microscope, which allows much greater magnification, enabling the visualization of organelles within the cells. Its use has been largely supplanted by immunohistochemistry, but it is still in common use for certain tasks, including the diagnosis of kidney disease and the identification of immotile cilia syndrome. Tissue cytogenetics - the visualization of chromosomes to identify genetics defects such as chromosomal translocation. Flow immunophenotyping - the determination of the immunophenotype of cells using flow cytometry techniques. It is very useful to diagnose the different types of leukemia and lymphoma. Cytopathology is a sub-discipline of anatomical pathology concerned with the microscopic examination of whole, individual cells obtained from smears or fine needle aspirates. Cytopathologists are trained to perform fine-needle aspirates of superficially located organs, masses, or cysts, and are often able to render an immediate diagnosis in the presence of the patient and consulting physician. In the case of screening tests such as the Papanicolaou smear, non-physician cytotechnologists are often employed to perform initial reviews, with only positive or uncertain cases examined by the pathologist. Cytopathology is a board-certifiable subspecialty in the U.S.
Anatomical Pathology one of the specialty training programs offered by the Royal College of Pathologists of Australasia (RCPA). The RCPA. To qualify as a Fellow of the RCPA in Anatomical Pathology, the candidate must complete a recognised undergraduate or postgraduate medical qualification, then complete a minimum of 1 year of clinical medical experience (internship)as a prerequisite to selection as a training registrar. The training program is a minimum of 5 years, served in at least two laboratories, and candidates must pass a Basic Pathological Sciences examination (usually in first year), the Part 1 examination (not before 3rd year) and the Part 2 examination (not before 5th year). Fellows may then continue into subspecialty training. Anatomic Pathology (AP) is one of the two primary certifications offered by the American Board of Pathology (the other is Clinical Pathology (CP)) and one of three primary certifications offered by the American Osteopathic Board of Pathology. To be certified in anatomic pathology, the trainee must complete four years of medical school followed by three years of residency training. Many U.S. pathologists are certified in both AP and CP, which requires a total of four years of residency. After completing residency, many pathologists enroll in further years of fellowship training to gain expertise in a subspecialty of AP or CP.